“It is the job of the progressive artist to propose an alternative reality, and preferably one in which all notions of common sense have been completely eradicated. This collection is our proposal.” So states the opening lines of the promo sheet that came with this double CD. This massive project (around 150 minutes of music) is the work of long-time associates Martin Archer (organ, electric piano, laptop, saxophones and bass clarinet) and Chris Bywater (organ, synthesizers, laptop, acoustic and electronic percussion and electric violin), with the help of Steve Dinsdale (drums, percussion and synthesizer), Walt Shaw (percussion and electronics) and Terry Todd (bass guitar). That’s just the core band. Orchestra of the Upper Atmosphere earns the “Orchestra” part of their name by rounding out their sound with a string quartet and wind and voice ensembles. Up to some 30 musicians appear on the album. So how is the album? The band make references to Terry Riley and Alice Coltrane in their promo sheet, and those are two perfect touchstones in beginning to describe this music. You can especially hear this on, for example, the first two cuts on the album, Scene From Above Parts 1 and 2 (clocking in at 5 and 15 minutes respectively) as the band blends lush but very moody orchestral arrangements and jazzy, free explorations in the vein of Alice Coltrane’s World Galaxy album with minimalist electronic patterns similar to Riley’s A Rainbow in Curved Air. But that’s only where things start as the band stretches out and explores a lot of territory over the course of two discs. The Opposition Effect, with its pounding martial rhythms, gothic organ, John Coltrane-esque saxophone and Carl Orff like choral interjections would not be out of place on, say, Magma’s Mëkanïk Dëstruktïw Kömmandöh album, and When Thin Clouds Scud Across a Bright Moon , with its hypnotic rhythms and circular choirs, could almost be a lost Phillip Glass composition. Space fans have something to enjoy here too, with tracks like the 14-minute long Anti-Crepuscular Rays, sounding like very early Tangerine Dream falling in league with David Bedford’s Stars End. If I’m making it sound like Orchestra of the Upper Atmosphere is all over the place and can’t decide what they want to sound like, I don’t mean it that way. There is a very homogenous quality to the music. The lack of guitars, along with the use of lengthy organ chords and mysterious orchestral arrangements tie it all together. The thing that’s really interesting about it all is that it is neither rock music, nor classical, nor jazz, yet comprises elements of all three, blending them into a unique, but really kind of undefinable sound. The explorations continue on the second disc, expanding outwards like the universe itself, into deep space ambience, experimental randomness and throbbing electronica. Sometimes, as on the track Their Dark Presence Stretches Through the Void, the music can get quite harrowing, suggesting a sense of almost Lovecraftian cosmic horror; or it can be vaguely unsettling, like the otherworldly woodland evoked in Rainforest Tension, but at other times it’s quite playful, as on The Umbral Length of Shadows, with its pulsing electronic signature, calliope-like arrangements and whooping Atom Heart Mother-esque choirs. One thing it never is, is boring. The band is careful to let each piece constantly evolve. Even when it’s tied together with a repetitive rhythm, the sounds swirling around it progress and allow the rhythm itself to seemingly transform with them. If you’re a fan of some of the above mentioned artists like Alice Coltrane, Magma, Phillip Glass, Terry Riley, Tangerine Dream and David Bedford, you must get this album. 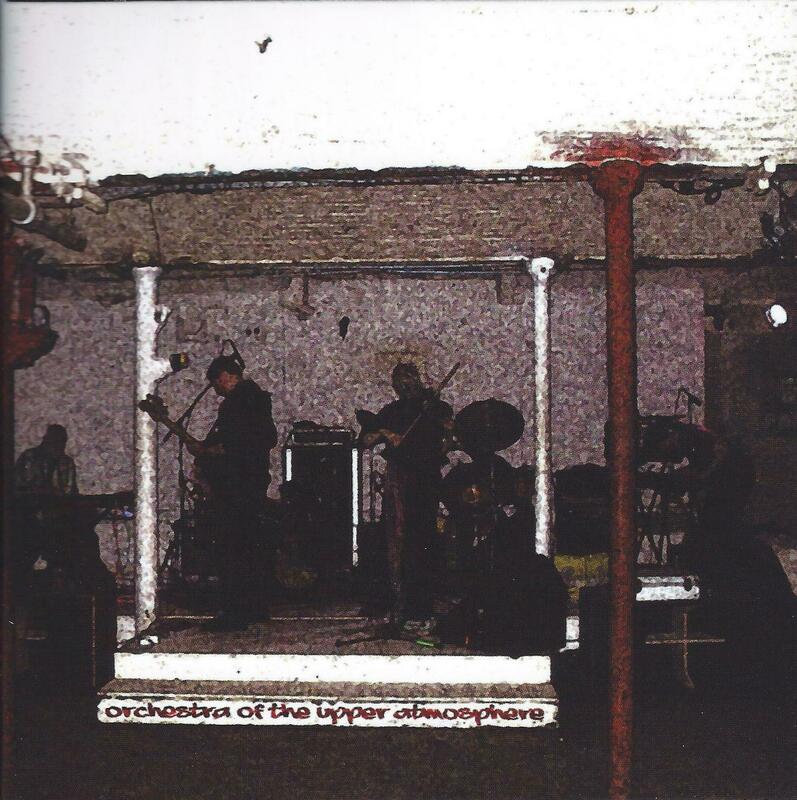 Orchestra of the Upper Atmosphere is a cosmic feast for the ears and mind, and will take you to places unknown, from the depths of the human soul to the farthest, darkest reaches of the universe. Highly recommended!